Former Staff Sergeant Lester Staples served with The Royal Army Medical Corps (RAMC) in a career spanning twenty-two and a half years. During this time he completed tours in Cyprus, Iraq (Op TELIC 1 and 2) as well as being a member of the Corps Football team. Thanks to the support of funding by Barclays, one of our corporate partners, and the advice of a Personnel Recovery Officer, ABF The Soldiers’ Charity was able to support Lester in attending a passive drug dog handlers’ course. Following his medical discharge from the Army in February 2016, this funding enabled Lester to harness his life-long love of dogs into setting out on a new career path. We met Lester and his dog, Beans, at Malpeet K9 Academy Ltd in Wales; a company that specialises in the use of operational dog teams as well as dog handler training. 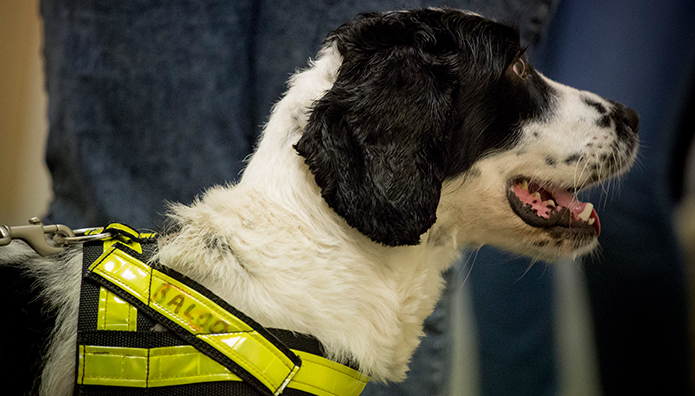 The duo were training in Bridgend where they were undertaking ‘line’ work- a highly pressurised exercise for Lester and Beans as they worked together to identify which individual in the line-up was carrying an illegal substance. 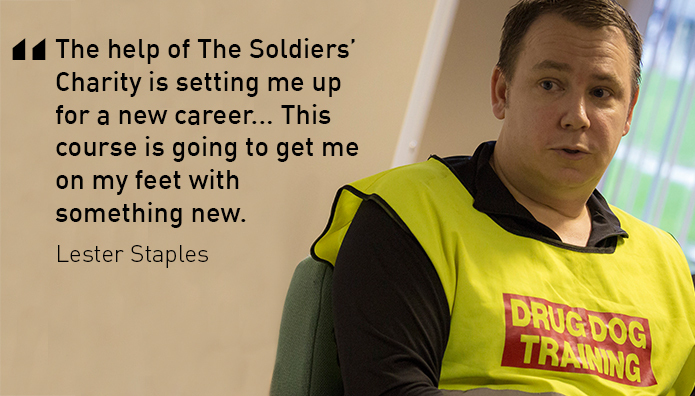 By making a donation you can help former soldiers like Lester make a successful transition from military to civilian life.